Thanks to Flash writer Jaime Paglia who posted this cover sheet on Twitter, we now know who is writing and directing the sixth episode of The Flash. We also now have confirmation on the title. 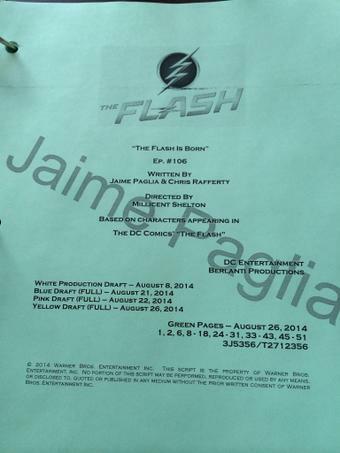 Episode 6 is called “The Flash Is Born,” and it’s written by Paglia & Chris Rafferty. Millicent Shelton is directing the episode. This is the episode that guest stars Greg Finley from Star-Crossed as Girder. Read more Flash upcoming episode details at our Flash spoilers page!